TAMCO is made up of its six unique brands: Tamlite Lighting, Fusion Lamps, RPP Devices, F4P First for Performance, MCG Motor Control Gear and Centaur Electrical Installation. These brands cover a wide variety of high quality electrical products and consumable materials, yet each of these brands work separately within their own market sector. Tom Wouters is the Engineering Manager who is responsible for product and process development for the many internal companies. TAMCO in Florida is the North American Headquarters. The United States generates 57% of all the products that are manufactured for TAMCO in the world. 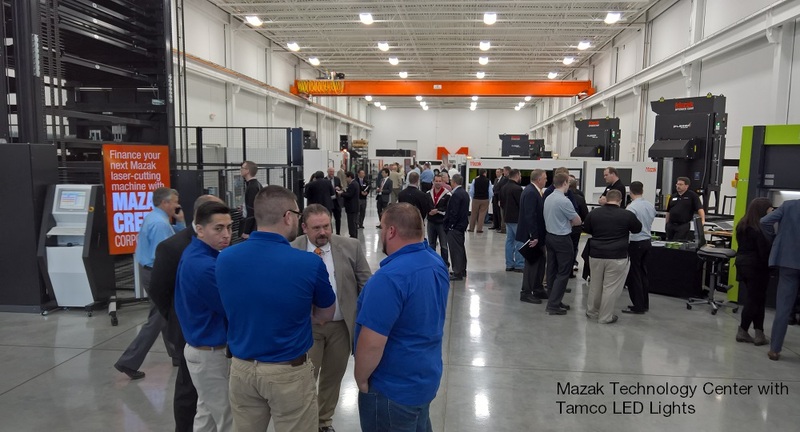 TAMCO purchased a Mazak OPTIPLEX 3015 Fiber 2kW laser in January 2015. TAMCO’s challenge was that their industry was changing to the LED revolution. LED technology has not come close to hitting its peak yet, so the technology is always changing. They didn’t want to be stuck with a hard tool system because of the always changing LED technology. They needed flexibility. Previously they were using a CNC turret press, hard tool or they were outsourcing their laser cut parts. The outsourcing was overpriced and wasn’t flexible enough. The outsourcing would require a 3 week window to get the parts cut but the technology is changing so quickly that by the time TAMCO got their parts, they were useless. TAMCO wanted the laser flexibility but did not want the cost and maintenance that came with a CO2 laser. In the lighting industry there is no downtime allowed so with fiber being easier to maintain they went that route. They also wanted the long life span that came with a fiber laser. TAMCO also wanted service that was in the area in case the machine was to break; someone could be out there within a couple of hours. Wouters explained, “Mazak won it for us on every level. 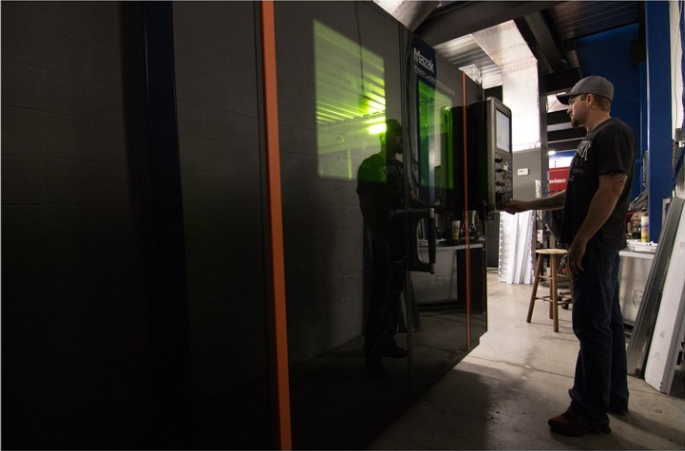 Mazak has a great reputation, premiere quality machines and a service staff that is local to us". TAMCO’s is now able to do the product development that was necessary for them. They also have the flexibility to do smaller orders and custom designs. Another benefit to having the laser, is that they are now able to make revisions on the fly fixing them within a matter of minutes. 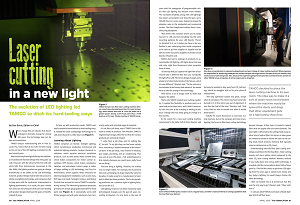 Wouters stated, “The laser has been a workhorse; it can carry its load.” TAMCO’s greatest improvement is that they have been able to work on developing the products, designs and system. Full article written by Dan Davis and published in the April issue of The FABRICATOR.